Australian technology innovator, BluGlass, at Photonics West, presented its latest remote plasma chemical vapour deposition (RPCVD) technical data. 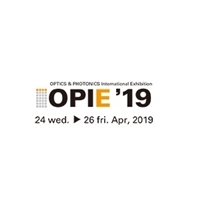 The presentation included data on the company’s recent breakthrough development of RPCVD grown tunnel junctions for LED applications. BluGlass’ Chief Technology Officer, Dr. Ian Mann was an invited speaker at the conference, and presented a paper titled ‘RPCVD of Group III Nitride Tunnel Junctions for LED Applications’. He outlined the technical detail and competitive advantages of the company’s patented RPCVD technology for the manufacture of GaN-based tunnel junctions in cascade LEDs. RPCVD enabled cascade LEDs are a promising solution that could address the significant industry challenge of LED efficiency droop. BluGlass is commercializing a novel semiconductor manufacturing process called RPCVD - for the manufacture of high performance LEDs, microLEDs and power electronics that offer several potential benefits to manufacturers including higher performing, lower cost and smaller devices. In December 2018, the company announced that it has successfully demonstrated functioning tunnel junctions, capitalizing on the unique low temperature advantages of RPCVD. Tunnel junctions are a key building block for cascade LEDs. A cascade LED is where two or more LEDs are grown in a continuous vertical stack using a tunnel junction to interconnect multiple LEDs in a single chip. This is highly desirable as it could prevent the fundamental challenge of ‘efficiency droop’ in high performance LEDs, by decreasing the required electric current while increasing the light-output. Cascade LEDs are expected to enable smaller, cheaper and higher performing LEDs – the three key interest areas of the LED industry. To date, functioning tunnel junctions, and therefore cascade LEDs have been prohibitively difficult to produce. According to BluGlass’ Managing Director, Giles Bourne, the breakthrough development of the technology results will help validate the strong commercial potential of BluGlass’ RPCVD technology to solve a number of the manufacturing challenges associated with the industry’s incumbent processes. Importantly this allows them to further discussions with a range of potential high-value partners in the LED and other semiconductor market segments, as the company seeks to capitalize on the broader commercial applications for its technology. There is significant interest in the potential of cascade LEDs and tunnel junctions, as efficiency droop is a well-known problem associated with high performance GaN-based LEDs. It is a fundamental property of LEDs where the efficiency of the light-output drops as the driving current increases, which means that the majority of today’s high-powered LEDs are being operated outside of their peak efficiency. RPCVD grown tunnel junctions could be commercially compelling for all high-performance nitride devices, including for high value applications such as LEDs for automotive lighting, UV LEDs for water purification, high power laser diodes for industrial machining applications and high efficiency multi-junction concentrated solar cells. The global LED market is predicted to reach US $96B by 2024; with the high-brightness automotive segment (a potential first adopter of cascade LEDs due to strict performance and size requirements) expected to represent $22B by 2024, capturing 23% of the total market. The RPCVD process can produce these critical enabling tunnel junctions in the LED device by capitalizing on its inherent competitive advantages. RPCVD operates at hundreds of degrees cooler than the incumbent technology and replaces expensive and toxic ammonia with inert nitrogen plasma. It is also able to achieve the required activation needed for a working tunnel junction during growth. 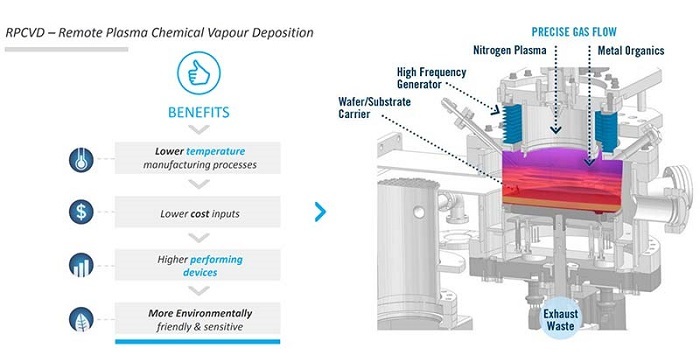 The industry incumbent process, metal organic chemical vapor deposition (MOCVD) relies on complicated and time-consuming ex-situ processing to achieve the required activation. This unique ‘as-grown and activated p-GaN’ (or AAG) technology is a fundamental advantage of RPCVD. Since notifying the market in December of its tunnel junction capabilities, BluGlass has received strong industry interest and looks forward to progressing those discussions with the technical details provided.